Every year companies release newer, bigger, and more advanced robot kits for kids to tinker with and program. Sometimes the robots are made from Lego; sometimes they’re made of metal. Some robots are expensive, while others are made for fun without breaking the bank. Either way, there are robot kits made for everyone to enjoy. Robot kits are useful to kids for many reasons. Kits allow children to explore their creative side while also learning how to code, build, and use other STEM-based skills. They also give children a taste of what their future job could be like. And, of course, the number one reason kids like robot kits: They’re fun! We’ve put together a list of the best robot kits of the past two years to help you decide which one is best for your child. Note: You can read our review here. This smart car kit is perfect for beginners who want to get their feet wet and build something cool without becoming frustrated with more complex directions. This kit boasts 24 different modules that can be programmed to run modes such as auto-go and infrared control. Elegoo also redesigned this model so it’s more user friendly and easier to put together without making mistakes. The car can be controlled using a Bluetooth-enabled phone, and the entire kit packs up into a small carry case. The kit is regularly priced at $74, cheaper than many other models that have similar objectives. Between the price and all of the activities packed inside the kit, this is one you’ll want to have on hand for your junior programmer. It comes with a 6V electrical motor to power the vehicles. Illustrated directions can help anyone build the interactive models, even if they have no prior construction experience. The one downside of this robot kit is that it doesn’t have any programming aspects, but it does involve using a motor and basic engineering. 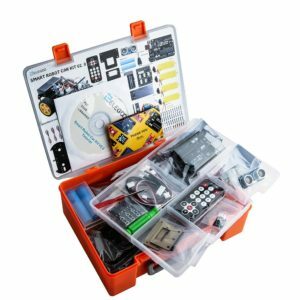 If your child is more interested in the engineering aspect of robots rather than programming, this is the kit for them. 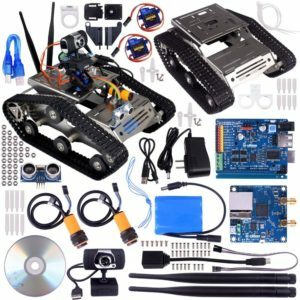 The Kuman Sm5 th car kit allows both kids and teens to have fun constructing either a five-wheeled car or military-style tank using Arduino programming. The car’s chassis is made of sturdy stainless steel, and there are many different modules that can be programed into the robot’s system. The car is wi-fi controlled using your phone, compatible to both iOS and Android devices. This kit is normally priced at $231, one of the more expensive models, but the experience gained from building this robot is well worth the price. One drawback is that the instructions can be a bit hard to follow, but Kuman’s customer service is extremely helpful and will work with you if extra assistance is needed. Robot kits can be expensive — some of the fanciest kits cost upwards of $350. But quality kits can be found without breaking the bank. 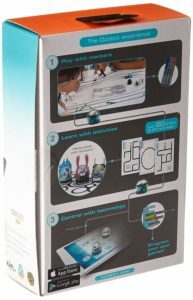 The Ozobot 2.0 Bit Starter Pack, at $59.99, provides quality at an affordable price. This kit isn’t without its drawbacks; since it’s cheaper, it doesn’t provide quite as many bells and whistles that it’s more expensive cousins do. But it has the basics, and sometimes that’s all that really matters. Ozobot is only about the size of dice, but don’t let its small size fool you. It’s packed with fun activities for kids to learn by doing. Kids first code Ozobot using markers — they’ll draw the code and Ozobot will respond. As they become more comfortable with what they’ve learned, they’ll then advance to “OzoBlockly,” a drag and drop programming language (note: MakeyMakeys and Scratch are another way to get your child acclimated to programming). Geared toward making the whole experience fun, Ozobot even comes with stickers that kids can use to personalize it. The Star Wars Droid Inventor Kit is perfect for the kid in your life who loves Star Wars (and if they aren’t a Star Wars fan, they will be once they finish building this Droid). Advertised as a kit that kids can put together without parents’ help — the kit comes with colorful step-by-step instructions — this kit is reconfigurable. This allows kids to transform their droid into one with a variety of functions. Kids are also provided with their own missions to complete and the chance to level up and perform more advanced tasks. Perhaps most importantly to kids, the kit comes complete with stickers and in-app missions to customize their droid just how they like it. This Droid can be driven either using a controller via a phone or by using the Force — and who doesn’t want to use the Force to power a robot? Interested in learning more? Check out this post over at the official Star Wars site. Or, you can read our review. Lego has consistently produced high-power robot kits the past few years, and this year was no exception. Enter the Lego Boost, a kit that features two motors and a color and distance sensor. A colorful kit, Lego Boost offers kids the chance to build a cat, guitar, vehicle, (imitation) 3D printer, and robot. Controlled by a tablet app, this Lego kit uses a drag-and-drop programming system that’s easily customizable while providing an easy experience for newbies. Lego and a robot? That’s a winning combination. The past two years have had some spectacular releases for robot kits. Between automated cars and Droids that can be moved using the Force to robots made from Legos, 2016 and 2017 robots are for everyone. The Elegoo UNO Project especially stands out as one of the best models of the year, and the Ozobot 2.0 has made its mark for being a powerful yet inexpensive kit. Regardless of what your child is interested in, you’re sure to find a kit that fits their needs. 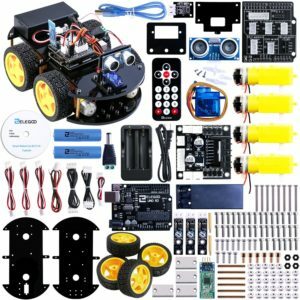 Why Should I Buy My Child a Robot Kit? Robot kits have become more common in the classroom in recent years, and they’ve also become common toys at home. They are more accessible and affordable than in the past, and perhaps most importantly, they’re a lot of fun. 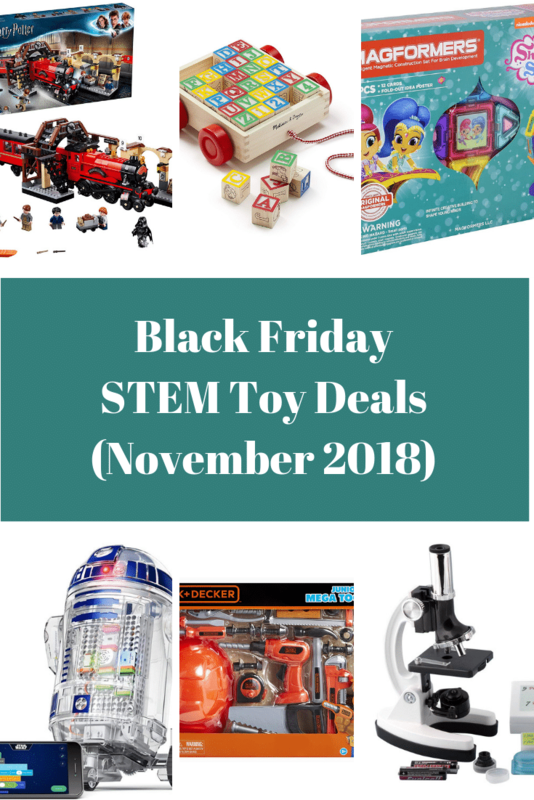 They are also a popular way to introduce kids to basic (and later on, more advanced) STEM concepts and an easy way to potentially foster later interest in robotics and coding. 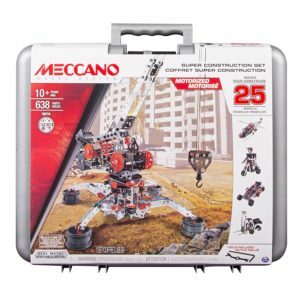 There are robot kits for all age ranges, from young children to teenagers, so you’re certain to find something for everyone in your family. What are the Benefits of These Kits? At a time when jobs in the next few decades will be largely based in automation and the STEM industry, it’s important that kids learn from an early age the basic concepts of computer science and robotics. Aside from potential future job skills, these kits can also teach problem-solving skills, creativity, and patience. Additionally, these kits are often practical and kids can have fun with them by using them to play games or do other fun activities. Lastly, there’s research that suggest robots can be helpful for children who are on the autism spectrum; working with roots can help improve a child’s social behaviors. And did we mention that robot kits are fun? If you want to learn more, I have written a little more at length about the subject. What Should I Look For in a Kit? All robot kits are different, and some have more of a focus on either construction or coding. Consider your child’s interest and what they’d like to learn. Also consider your child’s experience level; some kits are made for beginners, while others are made for those with advanced skills. Likewise, some kits have multiple activities while other kits are fairly simplistic. You can buy most kits directly through the distributor, but they’re also often sold from stores such as Walmart and Target as well as Amazon. Amazon consistently seems to have the best prices for kits. Do I Have to Supply Any Other Tools or Parts? We have attempted to note for the kits we discussed on this page any additional items you may need. Generally speaking, most kits come with almost all the tools and parts needed to build and use it. The main thing that usually needs to be supplied is a smartphone or tablet. Those act as the remote for the kits, usually, and sometimes are also used to code the robots. Occasionally, batteries may also be need to be provided.